There's no arguing that cats can be incredibly cute. But is it possible for them to be too cute? The answer is provided in the videos below: absolutely not! Cats ---whether kittens or adults --- can be cute as well as experts in using those sweet personalities to lift our spirits. Where would we be without cute cats? So if you need a cuteness fix, these are the video for you. Relax, grab a cup of coffee, and get ready to smile at the adorable cats in the following clips. 1. Kittens and goats and milk, oh my! These three ginger kittens would be the stars of the show at Sunflower Farm Creamery...if it weren't for the fifty-three baby goats. Watch these two species interact in the cutest ways in the video below. 2. It's a kitten wrestlefest, and you've got front seats to the show. Nola the rescue cat has her paws full keeping an eye on her rambunctious litter of kittens. They love to pounce and bounce and play, and they are too cute not to watch and adore. Check out how Nola's babies play in the following clip. 3. This cat loves her little kid. How adorable is this video? This cat shows her love for her little friend by gently head-butting him and licking his face. It looks like the beginning of a life-long friendship. Watch these two best friends in this video. 4. Here's a cat who has her own masseuse. This video is almost too cute to watch. A beautiful white cat lounges in the arms of her best friend, a Golden Retriever. The dog gently licks the cat's head and face while cradling her gently in his paws. Love truly transcends all species. Watch this clip and share the love. 5. A doll bed is the perfect sized toy for these sweet kittens. Looking for over four minutes of kittens playing on and around a doll bed? We've got just the video for you then. Enjoy watching these three kittens wrestle with each other on the bed. It will make your day and bring your blood pressure down. 6. Does your cat have this much patience? 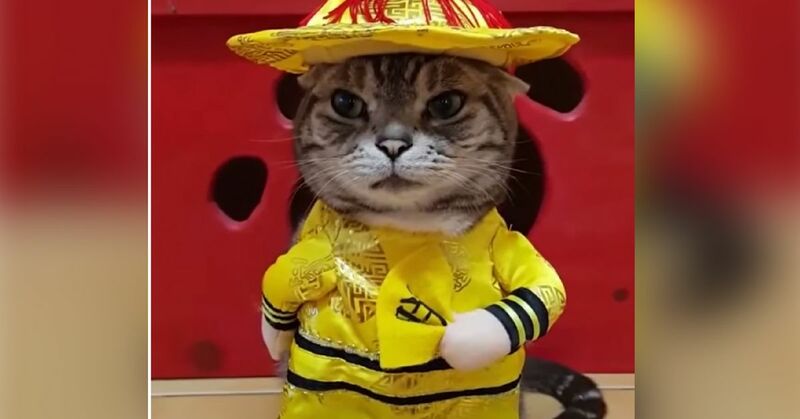 Not only is this cat cute in her outfit, but her seemingly infinite amount of patience is downright amazing. Watch this cat model at work in the clip below.